A Gram staining negative, rod-shaped, aerobic bacterial strain J5-3T with a single polar flagellum was isolated from coking wastewater collected from Shaoguan, Guangdong, China. It was motile and capable of optimal growth at pH 6–8, 30 °C, and 0–2 % (w/v) NaCl. Its predominant fatty acids were 11-methyl C18:1 ω7c (29.2 %), C16:0 (20.6 %), C19:0 cyclo ω8c (18.2 %), C18:0 (11.0 %), and C18:1 ω7c/C18:1 ω6c (10.9 %) when grown on trypticase soy agar. The major polar lipids were diphosphatidylglycerol, phosphatidylglycerol, two unknown glycolipids (GL1, GL2), and two unknown phospholipid (PL1, PL2). The predominant ubiquinone was Q-10, and the genome DNA G+C content was 61.7 mol %. 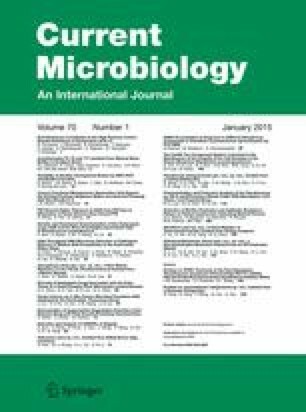 Phylogenetic analysis based on the 16S rRNA gene sequences indicated that strain J5-3T belonged to the family Hyphomicrobiaceae in Alphaproteobacteria. It shared the 16S rRNA gene sequence similarities of 93.8–96.1 % with the genus Devosia, 94.5–94.8 % with the genus Pelagibacterium, and <92.0 % with all the other type strains in family Hyphomicrobiaceae. It can be distinguished from the closest phylogenetic neighbors based on several phenotypic and genotypic features, including α-galactosidase activity, tetracycline susceptibility, major fatty acid composition, polar lipid profile, DNA gyrase B subunit (gyrB) gene sequence, and random-amplified polymorphic DNA profile. Therefore, we consider strain J5-3T to represent a novel species of a novel genus within the family Hyphomicrobiaceae, for which the name Paradevosia shaoguanensis gen. nov., sp. nov. is proposed. The type strain of Paradevosia shaoguanensis is J5-3T (=CGMCC 1.12430T =LMG 27409T). The GenBank accession number for the 16S rRNA gene sequence of strain J5-3T is KC222641. The GenBank accession numbers for the DNA gyrase B subunit gene sequences of strain J5-3T, Devosia chinhatensis DSM 24953T, Devosia insulae DSM 17955T, Devosia riboflavina DSM 7230T, and Pelagibacterium halotolerans CGMCC 1.7692T are KJ941045, KJ941046, KJ941048, KJ941047, and KJ941049, respectively. The online version of this article (doi: 10.1007/s00284-014-0689-2) contains supplementary material, which is available to authorized users. The authors thank the Institute of Microbiology, Chinese Academy of Sciences, for providing the transmission electron microscopy facility. This study was supported by the National Natural Science Foundation of China (31225001), and the National High Technology Research and Development Program (“863” Programs: 2012AA02A703 and 2013AA065701).